Bit of a shame today, Flake had her babies from Badger in the night, only 1 baby alive out of a litter of 4!! :( Such a shame, had been waiting and watching her for days!!!!!! I think she was fed up with me keep checking on her hutch!! They were all Dalmations as well and huge boars!! So I have alive a little Dal sow, which is better than nothing at all. Lovely to find some babies this morning from my Lemon Chin sow Anna. A very chunky litter of 3 baby Chinchilla boars! 1 Lemon, 1 Cream and 1 Silver. These are from my new boar Frosty, so will be a nice outcross. I had a lovely day at the Mid Sussex Cavy Club show on Sunday, my first show of the year. 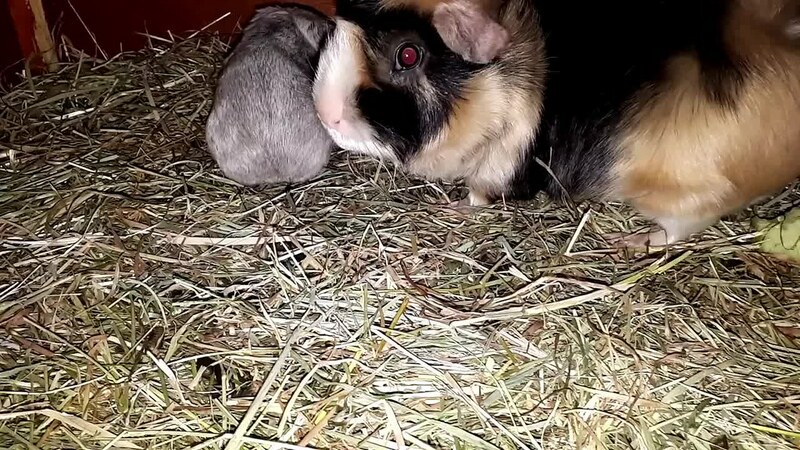 Not much to show though yet this year, I took my Pet sow Grace and also my baby Chinchilla boar called Galaxy to his first show. 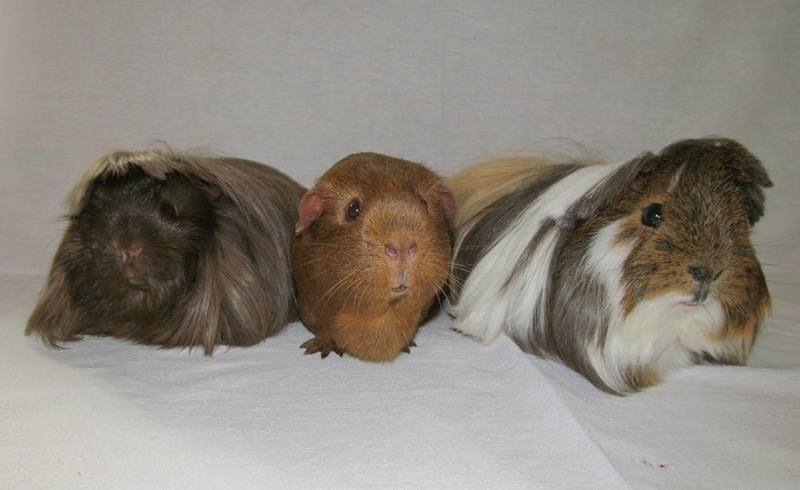 It was also the Southern Cavy Club Spring Stock show, so nice to see everyone!! I had to say goodbye to one of my most influential Chinchilla boars today. My lovely Smokey - Dad, Grandad and Great Grandad to most of my show Chinchillas. Will miss him, lovely boy, he had a great life and produced some super babies, the last litter I had from him was born in November last year!! Will miss you Smokey and your singing!! Very early start this morning!! Got up early (4.45 am!) to check on Salt and her pregnancy, to find she had given birth to 3 babies alive, and 2 still born!! But she was still having contractions, and I could feel one baby still inside. Hoping she would have this one okay, I waited and watched, but nothing happened, poor girl was very tired! So I called the vet at 8am and took her along to the vets in Banstead. After some extra Oxytocin, still no baby, so we decided to take a chance on a C-section for Salt. I have not done this before, but thought it worth a try, as she is such a laid back guinea pig. She has been amazing, she came through the operation all okay and with some tender care of extra feeding and keeping an eye on, she seems okay and she is happy with 3 lovely babies! 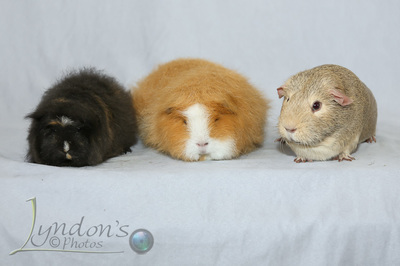 Babies alive are: 1 Lemon Chinchilla sow, 1 Cinnamon Chinchilla boar and 1 Silver Chinchilla boar, all very cute and growing well! Thank you so much Johnny at Kriek and Gibosn vets!! And now the start of the year gets even worse, my lovely show sow Vanilla has died very suddenly, I am so upset and shocked!!! :( Nothing wrong with her yesterday, I can only put it down to the cold weather and I think maybe she just did not get over losing her cage mate Tabitha, they had been living together for ages! I was so looking forward to showing her again this year! 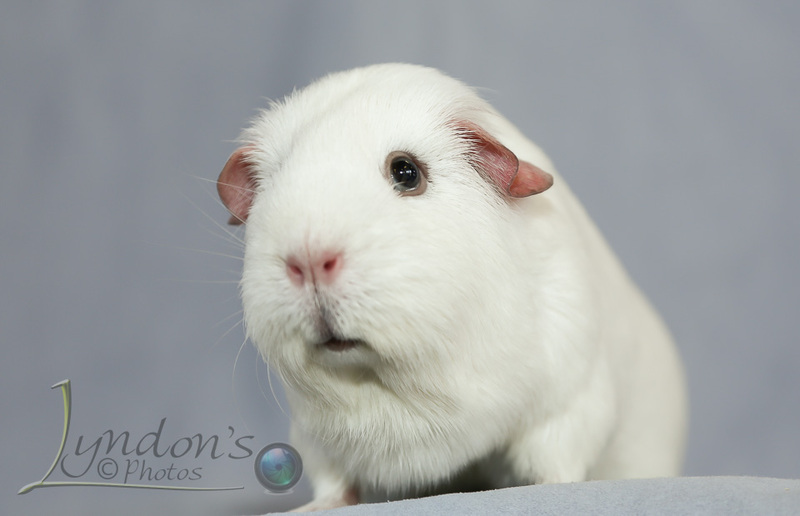 RIP lovely Vanilla, a very special girl! Lovely surprise this morning, Elsa has had her babies from Winston, a lovely litter of 3 boars, all chunky! Great day at the Worthing & Eastergate show today, Vanilla did well and came 3rd in the Guide Standard Challenge out of 11 and lovely Grace had a fantastic day and won Best Adult Pet and also best Super Pet out of 51!! Well done Grace at only your 2nd show!! :) I think she was snoozing in the pic!! That is it, last show of the year! Here is lovely Grace! :) Photo from Lyndon Nowell. I had a lovely day at the Fareham show yesterday. Also the SCC Adult Stock Show. All my Chinchillas won their breed classes and did well in the challenges. Grace did well at her first pet show and behaved extremely well! Also won the Fareham photo competition and Vanilla won Best of Breed. Lovely litter of babies born this morning from Chantilly and Smokey. Litter of 4, 2 Chinchillas and 2 Self Creams. Will keep an eye on them, typical the cold weather is coming next week!! Another lovely day on Sunday at the Mid Sussex Cavy Club Show. Vanilla and Brandon again coming home with super results. Vanilla won Best Guide Standard and Brandon came 2nd Best Guide Standard out of 16, 1 and 2 brilliant!! :) Lovely photo from Lyndon Nowell. Great day at the Kent Cavy Club show. Also hosting the SCC Young stock show for the u/5 exhibits. All my pigs did really well. Best results were from Brandon and Vanilla. 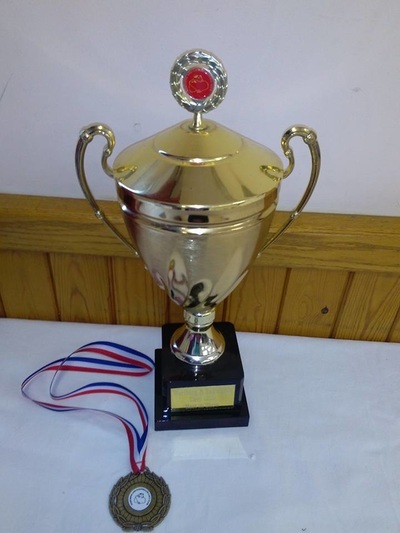 Brandon won Best Guide Standard for the SCC YSS, and on the Kent side Vanilla came 2nd Best Guide Standard out of 33! 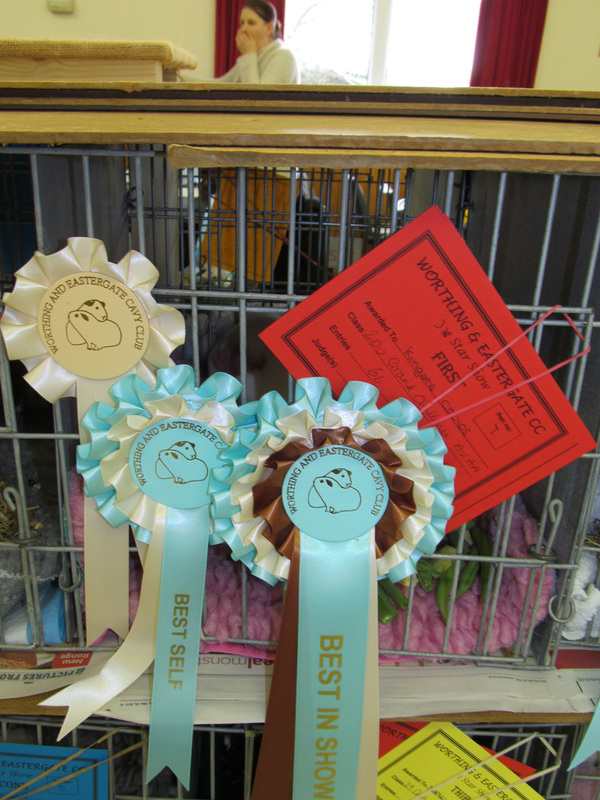 I also entered a special class for Best Groomed Cavy and won with my Silver Chin sow Bounty!! A lovely day. :) Here is a pic of Brandon. Lovely day at the Epsom Cavy Club show on Sunday. 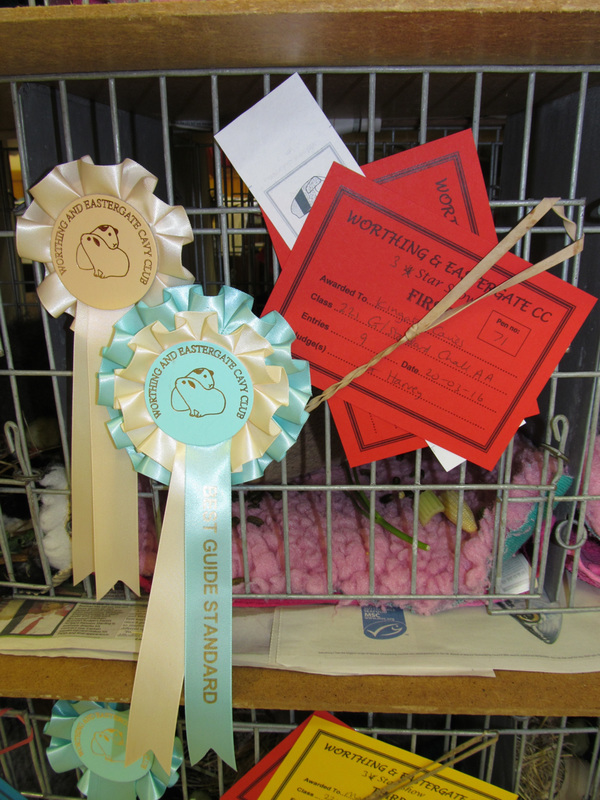 Best result was from Vanilla, she won Best Guide Standard out of 12 and came home with another lovely rosette. Great to catch up with everyone! I had a lovely day at the Dorking Cavy Club show, held at the Edenbridge and Oxted show for the very first time. Some testing conditions, rain and wind in the tent, and noisy chickens and ducks nearby! But my pigs seemed fine and coped really well. My 5/8 Sow Bounty did really well and had Best Chinchilla and 2nd in the Guide Standard Challenge out of 17! Best Guide Standard Line Up from Fareham. Photo from Lyndon Nowell. 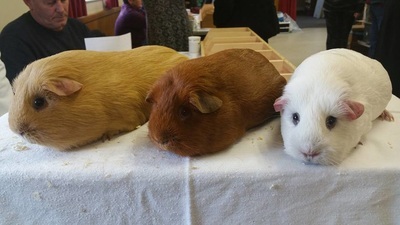 Lovely day at the Fareham Cavy Club show yesterday. Pigs did really well, Vanilla won Best Guide Standard, and my u/5 Lemon Chin baby boar came 3rd at his first show, out of 14!! :) Need to think of a name for him! Update - he is now called Brandon! 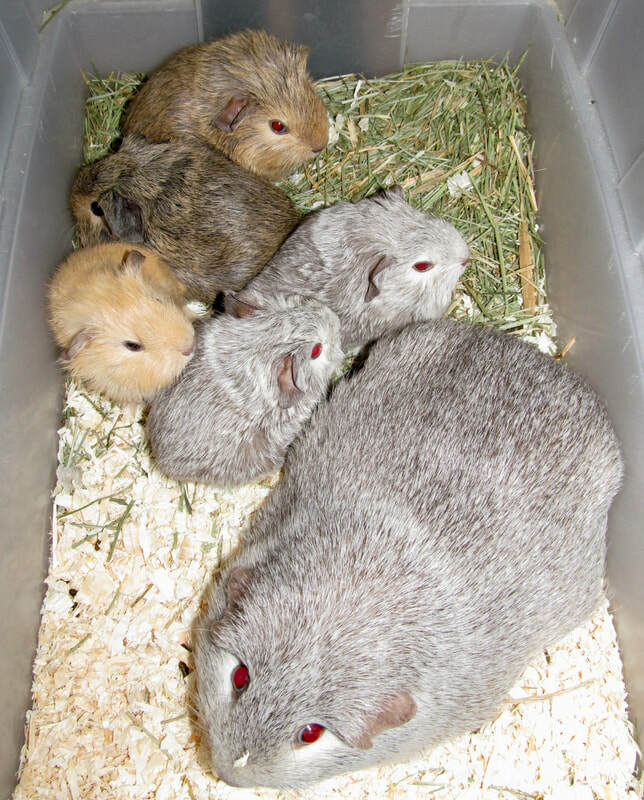 And a week after Chantilly, Queenie has finally had her babies - a litter of 4 chunky Chins! 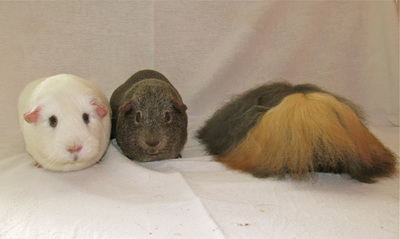 1 Lemon Chinchilla sow, 1 Cinnamon Chinchilla boar, 1 Lemon Chinchilla boar and 1 Cream Chinchilla boar. Running around already today, so cute! Lovely day at the Dorking Cavy Club Show. Took my adult Chinchilla sows, with Aurora coming out as Best Chinchilla and she came 4th in the Guide Standard Challenge out of 27! At last Pepper has had her babies from Craven, she kept me waiting and fretting!! She was huge, and as I expected, she had a litter of 6 this morning!! Two Chinchillas and 4 selfs, all seem fine. More details to come. Interesting day today, it must be a special day for my guinea pigs!! Salt had her babies over night, and I have a litter of 3 lovely Chins, there could have been 4, but saldly 1 was DOA, real shame, but this is her first litter! They are lovely chunky babies! I noticed that last year on this day, my sows Ariana and Tatyana, had their babies on the same day!! I am waiting for Pepper, Salt's sister to have hers, what are the odds that she will have them today as well!!! We will see. I had a good start to the showing for 2018. Lovely show at the Mid Sussex Cavy Club. 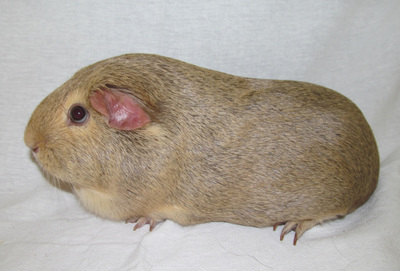 My Cream Chinchilla sow Vanilla came 3rd in the Guide Standard Challenge out of 20! She also got Best Chinchilla and won a lovely rosette. Sometimes life can be so unfair!! Sad day today, my lovely Californian boar Truffle has died, such a shame and just when he was so young, does not seem right. RIP lovely Truffle!! :( That is 2 boars I have lost in January, and not 2 boars I would have expected to die!!!!!! Gutted. Happy New Year everyone. Please note the Chinchilla now has a new Guide Standard, and has name changes for the different colours! Such a shame we have gone back to these, it was only a few years ago that we changed to Silver and Cinnamon etc, now we have got to go back to White/Grey and White/Chocolate!!! Details on my Chinchilla page. 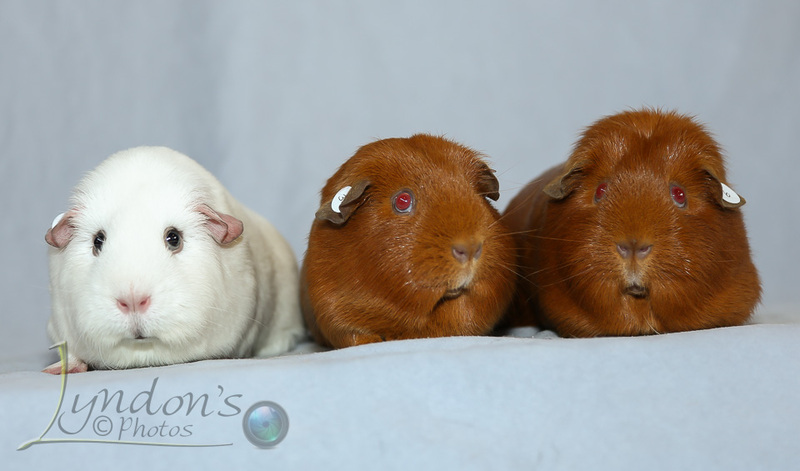 Nice surprise today, my Cinnamon Chin sow Queenie had a litter of 6 while I was out!! Couple are a bit small, but all seem fine, hope she will cope with them! Unfortunately the smallest baby boar died after about a week, the really cold weather just did not help! Not a good time of year to have babies! 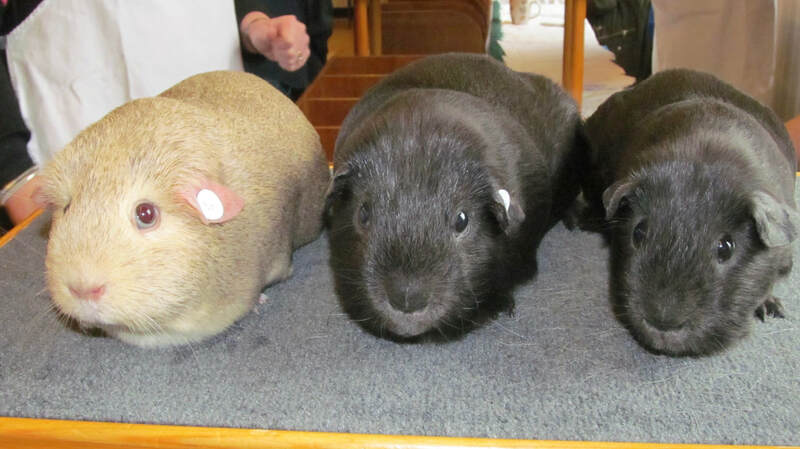 I had a lovely day at the Dorking Cavy Club show yesterday, all my Chins won their breed classes, so happy with that! Been a busy last few days. On Friday 8th Sept, Amber had her babies. She popped them out late morning while I was not looking!! She has had 4 pups, 3 Chinchilla sows and 1 DE White boar. All doing really well. Will be interesting to see if any turn Cali!! Chuffed to bits, my Silver Chinchilla sow Aurora won Best Guide Standard yesterday at the SW Championship show out of 60, in the RVCC stock show!! Brilliant! 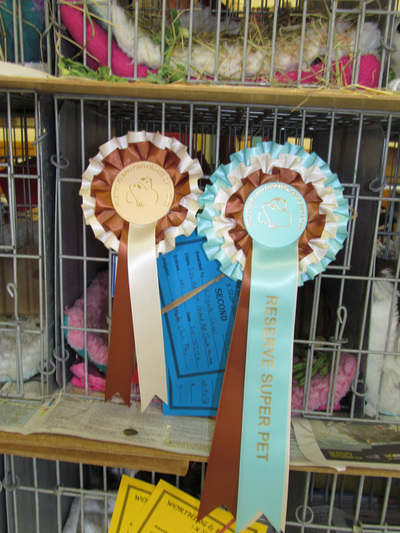 :) She also won Best Chinchilla, and Craven came 3rd Best Chinchilla out of 12! Winston also did well in the Stock Show, so a super day! I had a lovely day at the Epsom Cavy Club show yesterday. Quiet show, but lovely to catch up with a few friends, as I have not been to many shows this year. Aurora won Best Guide Standard, and my 2 u/5 Chinchillas did well at their first show. My young Cinnamon Chin sow came 2nd and my Lemon Chin boar Winston came 3rd, so a good day. Found my lovely boar Yoda dead today, no real reason, very sad, RIP lovely Yoda. Last of my adult Lemon Chinchillas, just as well I have had some Lemon Chins born recently. First show of the year for me at Fareham Cavy Club on Saturday. Lovely show, I took along my youngsters, they did really well!! Aurora won Best Guide Standard at her first show out of 28 and Padme came 3rd Best Guide Standard, well done girls, great start to the year!! :) Here are a couple of photos from Lyndon Nowell. Nice to have another litter this year, my Cream sow Chloe has had a litter of 4 from Smokey. 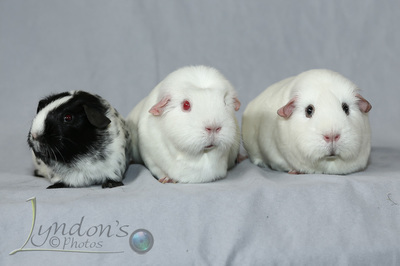 1 Cream boar, 1 Cream Chinchilla boar, 1 Silver Chin sow and 1 Cinnamon Chin sow. Lovely babies. She is being very attentive. I was a bit concerned, as in her litter she had last year, she got one baby stuck and I had to rush her to the vet. Interesting she had them at the same time of the day as she did her last litter!? My first litter of 2017. Lovely babies from Cloud and Cheggers. A litter of 4 Chinchillas born about Midday, just missed her having them. 2 Silver Chinchilla boars and 2 Cream Chinchilla boars. Things have been a bit quiet here. Such a hard time for me as my mum died on 8th December, so Christmas has not been great. Then also my lovely Demi died on Christmas Day, so not a good time!!! Looking forward to a better 2017. I had a lovely day at the Dorking Cavy Club show yesterday. 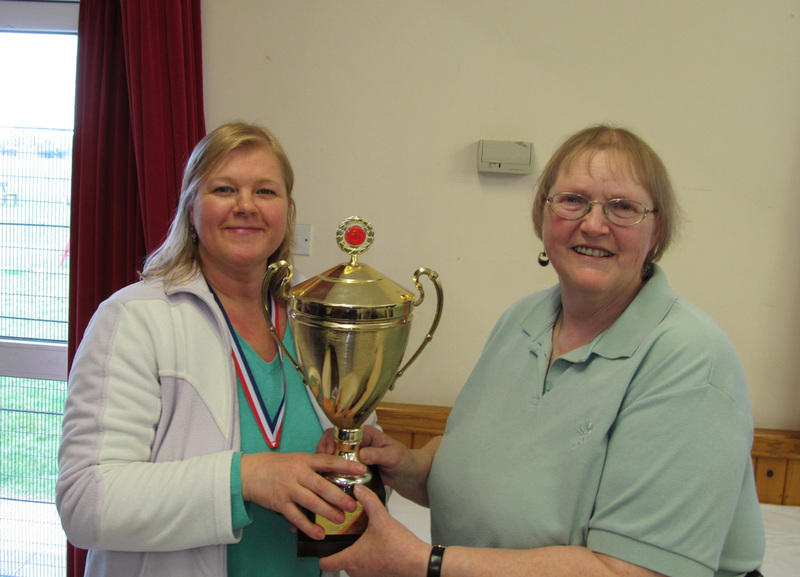 Pattinson won Best Guide Standard with my u/5 Chin sow Queenie coming 3rd. Thank you for a lovely show and lunch! Lovely photo from Lyndon Nowell. I had a nice day at the RVCC show at the Solent venue in Southampton. Busy show, good to go to a new venue. Then came home to my sow Cloud and her babies from Miracle, a litter of 3 PE Whites, all sows!!! More pups popping out today! 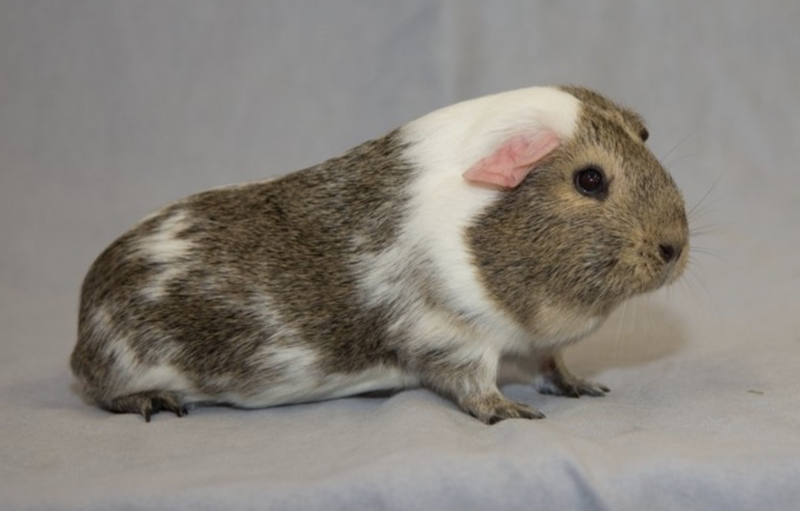 Ivy had 2 babies from Edmonds, both really chunky. 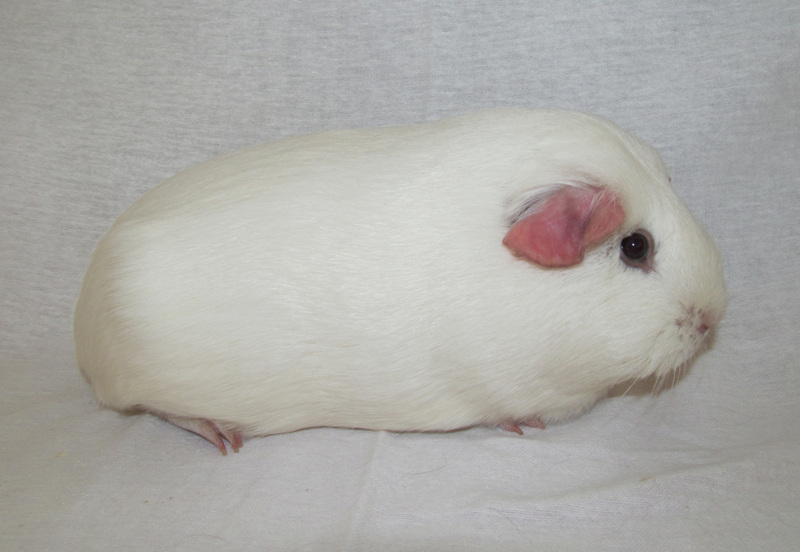 A Cream Chinchilla boar and a Silver Chinchilla sow, look super! :) One like dad and one like mum!! Bit of a surprise this morning, my Chinchilla sow Ella had one huge baby - 162g!!!! Shame it was not a Chinchilla???! Taking after her dad Ben, being rather large!! Busy day today, poor Chloe struggled to have her babies. Unfortunately I missed her first one, a Lemon Chinchilla DOA. But she seemed to be struggling with the rest, so I rushed her down to the vets. Lovely vet Laura sorted her out with a dose of Oxytocin to help her contractions, but one of the babies was a bit stuck, a boar of course!! But Laura got him out and Chloe had the rest of the babies easy. 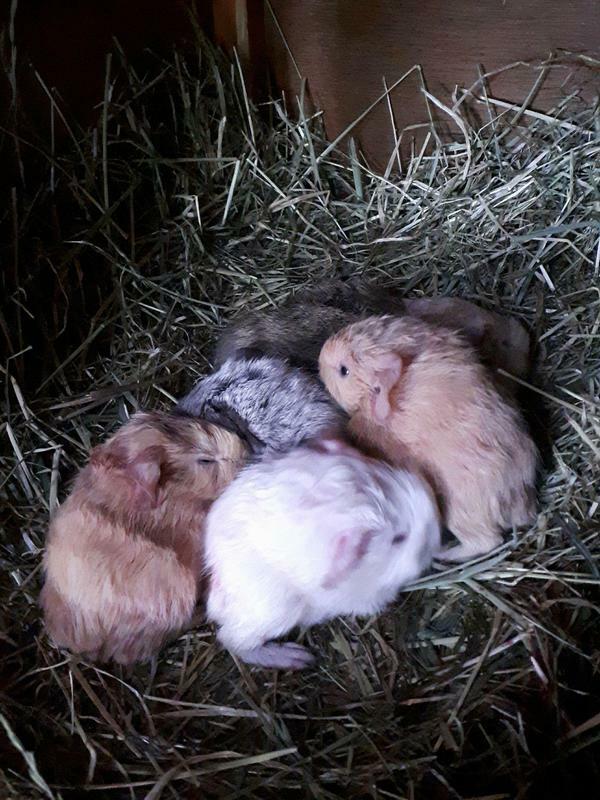 So came home with 4 lovely chunky babies. Thank goodness they were all okay, could have been a different story!! 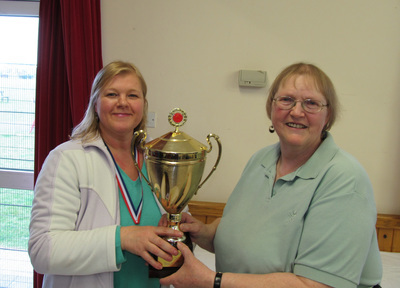 Lovely friendly day at North Herts Cavy Association show, Pattinson came 2nd in the Guide Standard Challenge. I like going to this show, easy going and lovely lunch from Trudy. I had a lovely day at the Mid Sussex Cavy Club show yesterday. Chins did well, Ella won Best Guide Standard for the first time and Pattinson came 3rd. Ariana had a single pup in the night, a huge Lemon Chinchilla, so very sad DOA, poor thing!! Typical she had it over night, sometimes breeding guinea pigs can be so frustrating. Why could she not have given birth while I was there, I had a feeling she was only going to have one pup. Ariana is fine, which is the main thing. She is with Tatyana, looking after her 2 sows. Went to the Real London show yesterday, had a lovely day catching up with friends and chatting!! Only took 2 Chinchillas, Ella and Pattinson. 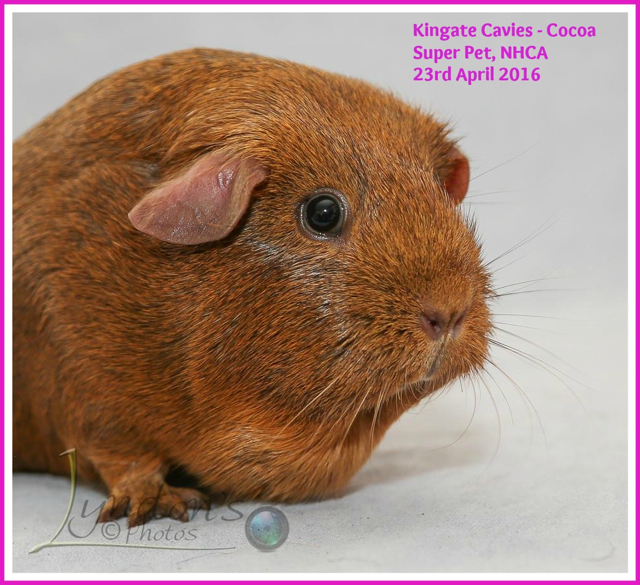 I had entered Cocoa in Pets, but of course, I could not take her!! :( Not very good places for the Chinchillas, but a lot of competition with some super Swiss particularly, here are a couple of pics of Pattinson. Here we go again, ups and downs of keeping animals. Now I am devastated, lost my lovely pet sow Cocoa!!!! She just could not cope with the hot weather, so very very sad, she was not even a year old??? That is the trouble when they are big pigs, they cannot cope with the heat, and maybe there was an underlying heart problem, as I lost her Dad Orlando at a young age as well? 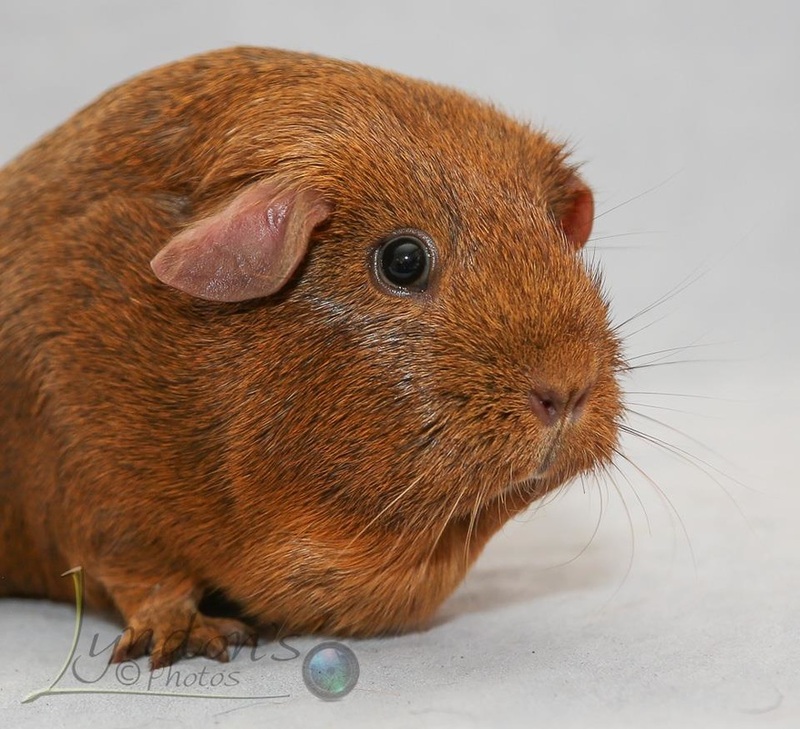 RIP lovely Cocoa, you will be missed very much! Cassie had her babies from Chrome late afternoon yesterday. Of course she popped them out just when I wasn't looking, how do they manage it, I have been watching her for days and days!!!!! So frustrating!! So unfortunately 1 huge Self Cream boar DOA. But I have alive a Self Cream sow, lovely size very cute. But interesting from Chrome, no Dalmations and no Chins at all, real shame!!!!! 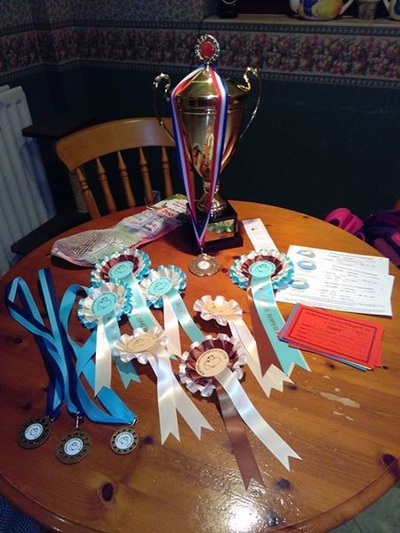 Lovely day at the Mid Sussex Cavy Club show yesterday, clean sweep with my Chinchillas, 1st 2nd and 3rd best Guide Standard with Citron, Pattinson and my first time out u/5 sow Ella. Always a pleasure to go to this show! Also won BOB with Citron. Here are her rosettes. I had a lovely day at the Kent Cavy Club show today, one of my favourite clubs. 2nd and 3rd Best Guide Standard out of 12 with Citron and her little niece Ariana! 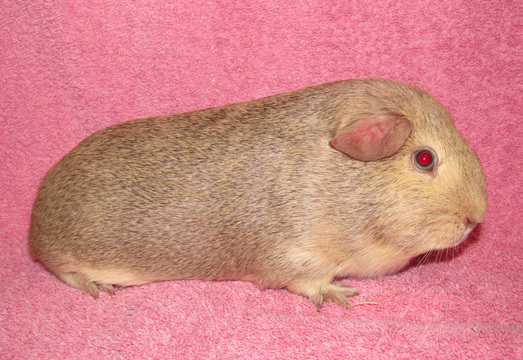 Lovely result for Ariana, she is a cute silver chin sow and daughter of Edmonds. She beat her dad today! Sparkle also got best DE White and did very well in the Self Challenges. A good day, thank you Kent Cavy Club. Lovely day at the Dorking Cavy Club show today. Quiet, but nice and easy going show, lovely lunch cooked by Claire and Jo. 2nd and 3rd Best Guide Standard with Citron and Edmonds out of 13. Here is Citron. Morag had her babies from Cheggers in the night, a litter of 7!! Unfortunately 1 Chin DOA. But alive are 3 Chinchillas and 3 DE Whites. All quite small, but Morag is a good mum, hopefully she will cope with them all, but I will keep an eye on them! There are 2 Lemon Chins hiding under there somewhere!!? Here are some of Lyndon's great photos. I had a super day at the Fareham Cavy Club show yesterday, hosting the Southern Cavy Club Spring Stock Show. My lovely Sparkle did really well again, she was 3rd BIS out of 165 pigs!!!! Well done Sparkle, fantastic result! She was also Best DE White and Best Self. Chins did okay, with my best result with Edmonds, 3rd Best Guide Standard out of 27. Here are some of Lyndon's photos from the show. I had a lovely time at my first show of the year, the Mid Sussex Cavy Club show. Citron was 2nd in the Best Guide Standard section and my DE White sow Sparkle did very well. She was in the last 6 line up for Best Self judging out of 30. Lovely to be back showing again. Not a good start to the year lost my lovely boar Chaplin, very, very sad :( Only had one litter from him, and I had sows lined up for him in the new year!! Gutted is a total understatement! !